Ashley Rawls shares her story with I AM SECOND, a movement to inspire the revolution of Second. Ashley Rawls carried the weight of the world on her shoulders. She came from a strict home in which the expectations for success were extremely high. Every year she and her family watched beauty pageants with the hopes that one day Ashley would be the winner on that stage. This pressure to become the beauty queen led Ashley to control her eating, which developed into anorexia. While they watched their perfect beauty queen light up the stage, they didn’t know Ashley was hiding a secret that was tormenting her soul. I didn’t know how to be normal. I didn’t know how to have a normal relationship with food. How do you let go of control without losing control? Ashley says her dilemma was never about image it was about control the control of having a normal life. Stability. Balance. It was about security. Ashley thought that if she could control her weight and what she was eating, then she would be happy. But the more she tried to control her eating, the more the eating disorder controlled her. Is there hope for letting go without losing control? She eventually found peace and freedom when she gave up and handed her eating disorder over to God. She had to learn to trust that He could take care of something that had become too big for her, and that He loved her enough to be willing to help. I’ve found, in my life, that the more I try to control something the worse I feel. But when I call out to God and ask Him to take my burdens from me, I feel a sense of relief and hope. “The funny thing about giving up control is that I never really had control in the first place. My life has always been in God’s hands, and all I was doing was getting in the way of what He was trying to do in me and through me.” Watch as Ashley shares her story in her own words. I AM SECOND encourages you to go a step further, talk with the people in your life. Spread the revolution of Second. Share the videos with friends. Gather a group of friends to discuss the films. Start an I AM SECOND group. 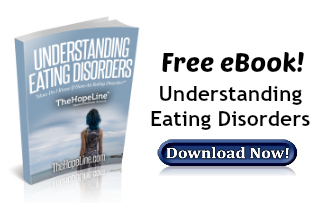 If you would like more information on eating disorders, please download our free eBook.